Remy Fortier – Don’t Stop! Remy Fortier – Don’t Stop! When I was talking with Myrla Raymundo in our interview, I asked her what advice she would give our listeners. She would know, she hasn’t stopped. Myrla has received over 200 awards, recognition for her work in various service organizations and city government. You can listen to her story here. Myrla’s words got me thinking. Why is it so important to me not to stop? What am I really trying to create? The answer is community. My goal in writing my blog, the monthly newsletter, and hosting Union City Advice Givers podcast is all centered around my community. The people I’ve met in my life, the past 10 years working in real estate, and the guests on our show. Yesterday I got two sales calls. One from the Safeway in Hayward asking if I would like to buy the advertising on all of their shopping carts. The sales guy was nice enough, he wasn’t pushy. But he didn’t understand me at all when I told him I don’t advertise. “How do you get business?” He asked. Through personal referrals, through community. I didn’t have time to explain to him every way to connect with community. I was polite and just told him no thanks. The second phone call was pretty funny. 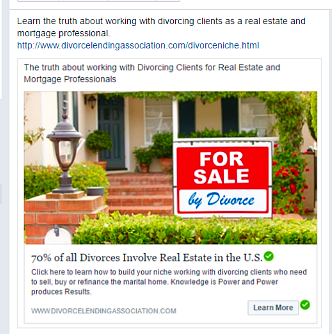 On facebook I see ads all the time geared towards real estate agents and real estate lead services. Yesterday, I saw this one advertisement that always grosses me out, each and every time I see it. Divorce Leads. Sometimes the depths that the average agent will go to, to try and get new business hits a new low. Basically they are selling a webinar to teach agents how to track down people going through a divorce. For most people, divorce is one of the worst time periods of their lives. Would you want to know that your real estate agent took a class to learn how to pinpoint you as a lead, during your divorce, and then learned to peruse you relentlessly to see if they you need to buy or sell a house? Each time I see one of these ads I shudder. I didn’t take the time to explain my way of building relationships with my community. It would have been wasted breath. I just got off the phone as fast as I could, laughing to myself. Both calls served as a reminder to me, why I “Don’t Stop.” As Myrla put it. I focus on consistency and perseverance because writing is difficult. Working HARD to keep putting out great material, content that is authentic to who I am and showcasing the awesome community around me.